Better, safer water in your home for drinking, bathing, cooking and protecting your water-using appliances. Simple, effective commercial / industrial water treatment solutions that minimize water waste, energy use and chemicals. Have a question? Call us today at 1-888-766-7258! Call us today at 1-888-766-7258, so one of our water experts can help! 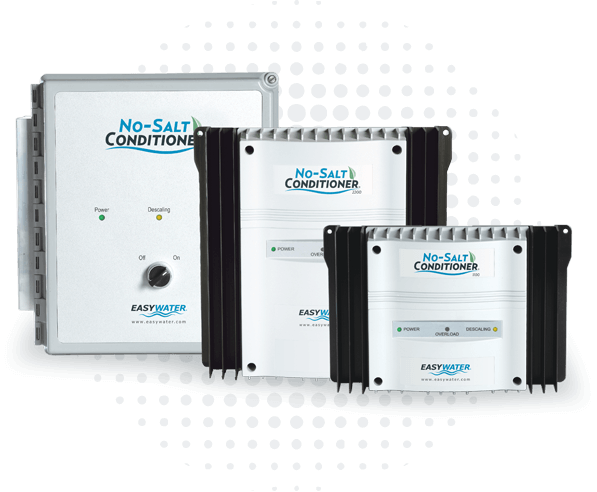 Our most popular product, the iconic EasyWater No-Salt Conditioner uses a range of electronic frequencies to remove and prevent hard water limescale. This water softener alternative helps extend the life of appliances, clears plumbing lines and improves water flow, with no maintenance at all. We develop and manufacture innovative residential and commercial water treatment solutions that provide effective results while minimizing water waste, energy consumption and the use of chemicals or salt.